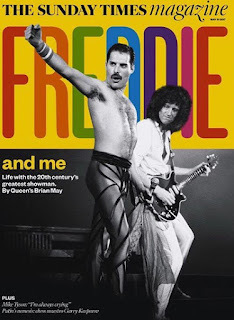 Home / -News- / Brian May / Queen / Brian May Lashes Out at London Sunday Times Over Article "Betrayal"
Brian May Lashes Out at London Sunday Times Over Article "Betrayal"
Brian May of Queen is very proud of his new book, Queen in 3D, that combines two of his passions, music and stereoscopic photography. According to May, he talked at length about those subjects with a reporter from The London Sunday Times but the resulting article was nothing but "tired old stuff". The guitarist says that he entered an exclusive agreement with the paper guaranteeing that he would not show the contents to the book to any other source and giving them full permission to use pictures from the release. The paper ended up using just two photos, "one of them reproduced not much bigger than a postage stamp", with the rest of the article filled with stock Queen photos from other sources. The opening of the piece inside says "Tragedy, debauchery ... and dwarves ... " !! NONE of this tired old stuff features in the book, or was discussed in the interview. This woman came into my house, pretended she was a fan and was going to write a nice piece about the book, as agreed; then went away and wrote this pathetic sensationalistic drivel. I'm angry and disgusted. It's been a long time since I've seen such crass journalism and experienced such a betrayal of trust. Folks - please ignore this trash - the book is NOTHING like this. The front of the Sunday Times Magazine shows Freddie Mercury and May from the 70's with the headline "Freddie and Me...Life with the 20th century's greatest showman. by Queen's Brian May". I think the worst part of it all to me is that people will see this article and think that this came from me. They’ll think that this is the way I see things, and that this is what the book is about. Of course, nothing could be further from the truth. He finished his statement by saying "Well, here's a message for you, Krissi Morison and your scummy pals. I hope you think it was worth it. Because neither I nor any intelligent reader of this travesty will ever give you the time of day from here on in." Brian's full statement can be read at his webpage.